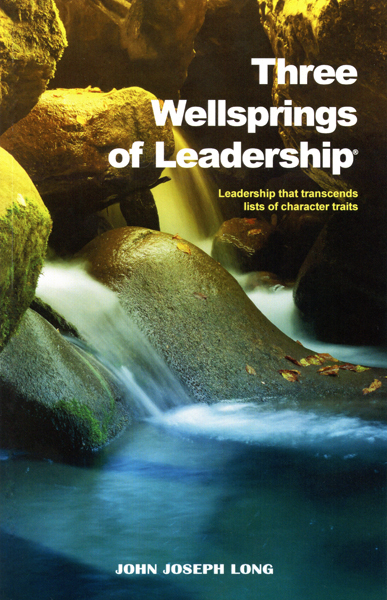 Three Wellsprings of Leadership: leadership that transcends lists of character traits, John Joseph Long, 2013, ISBN 978-0-9887893-0-2, 117 pp. This is not a book about leadership, instead, it is a book about the thinking which leads to great leadership — an ontology of leadership not a punch list of desirable traits. Long’s book is uncommon in the field since he does not present a list of character traits nor does he provide a formula followed by the top ten in any field. What Long does is give us insight into the long game of what comprises a leader which he names “Three Wellsprings of Leadership” — character, hope and imagination (though, he capitalizes each term). He treats each in dedicated chapters so that deeper understandings, more fundamental than what other and simpler written texts consider fundamental, are made latent. Exposing these most fundamental of the aspects of leadership, which are most often unconsciously and blindly accepted, is the best way to lay a foundation to better leadership. This is the ontological approach chosen by Long — as opposed to recipe listings it is the knowledge and intuition of a master chef which has been explored. Long has excellent credentials for this analysis having played in “the majors” such as international trade, arguing State Supreme Court Cases, on the board of a $1.6 billion holding company and running not one but two state environmental agencies (among other accomplishments). He now is an adjunct professor at Palm Beach State College where he also continues pursuing his interests in what makes for the better leader. His thoughts in Three Wellsprings of Leadership can work for a general as well as a captain, and just as well for a movie maker or the top business executive. These 117 pages are saturated with carefully selected and elegantly crafted language which summarize Long’s years of expert thought and study of his subject.